This portable and versatile gas BBQ, weighing less than 4kg, includes four interchangeable cooking surfaces. These are the pot stand, the BBQ top, the non-stick flat griddle and the pot (also used as a dome). This portable and versatile gas BBQ, weighing less than 4kg, includes four interchangeable cooking surfaces. 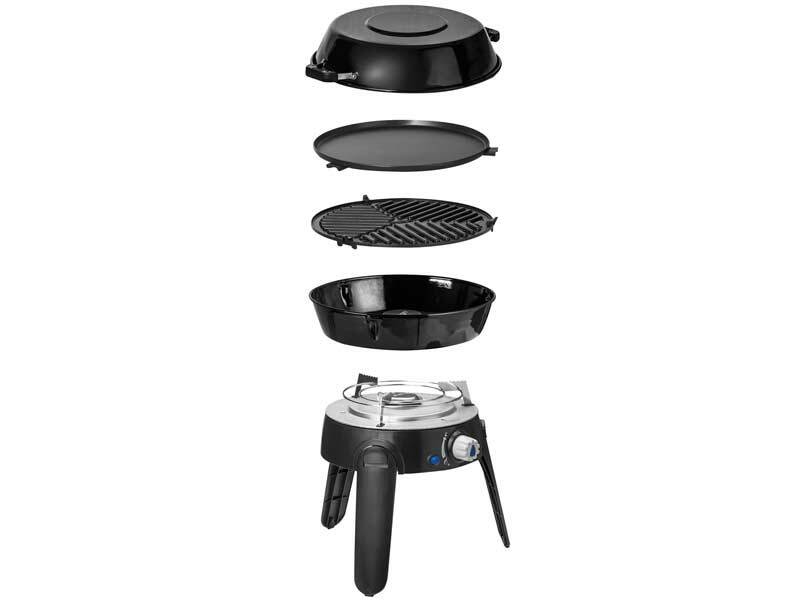 These are the pot stand, the BBQ top, the non-stick flat griddle and the pot (also used as a dome). These all pack into a convenient carry bag. The Safari Chef 2 is available as a high or low pressure unit. The Safari Chef 2 HP operates off the CADAC 500g EN417 threaded gas cartridge (not included) or any other EN417 threaded gas cartridge which fits directly into the BBQ, while the Safari Chef 2 LP works off any 2.8kPa supply. The Safari Chef is ideal for camping, hiking, fishing, caravanning and sports events.